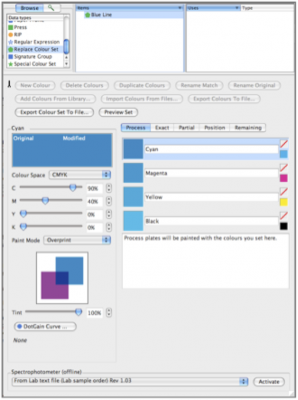 There are a number of ways to create a replacement colour for the process colours. Select the process colour patch on the right, eg. Cyan. This copies that process colour into the replace patch on the left. With the replace patch selected, adjust the values as desired. Double-click the replace patch on the left. This displays a chooser allowing you to select a colour from a Special Colour Set. Choose a Set, select a colour and press OK. Make adjustments to the values as desired. Drag a colour in from a Special Colour Set or another Replace Colour Set and drop it on the replace patch on the left. Select the colour and make any adjustments required. Use an online Spectrophotometer to read a colour directly into the Replace Set.